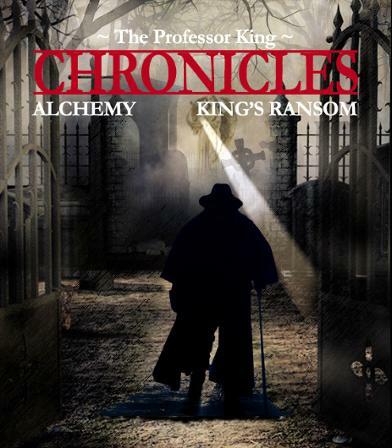 The Professor King Chronicles is a two-part adaptation of the Steampunk musicals 'Alchemy' and 'King’s Ransom' written and composed by Clive Nolan. Set in a quasi-Victorian world of heroes, villains, romance and the supernatural, they follow the exploits of Professor Samuel King and his trusted cohorts Eva, a beautiful tribal warrior, and William, a resourceful ex-thief. In 'Alchemy', our brave band tackle the evil Henry Jagman who dreams of conquering death itself - and does not care who he has to kill to achieve it. Along the way, William falls for the alluring Amelia Darvas, who holds vital information key to their success. But their happiness is cut tragically short when Amelia dies at the hands of Jagman’s henchmen. However their love transcends death itself as the story reaches its dramatic climax. Set several years after 'Alchemy', 'King’s Ransom' pitches the Professor against a new enemy, Colonel Scovil, who is plotting to kill the Prime Minister and replace him with one of his own. The Professor and his tribe must call upon help from beyond the grave to save the world from Colonel Scovil. They trade blades with new nemeses including Rosa, a beautiful yet mute assassin, before discovering a traitor in their midst leading to the kidnapping of Eva and a duel to the death. Taken together, 'Alchemy' and 'King’s Ransom' will be cinematic musical extravaganzas, offering audiences a powerful, musical experience fused with glorious locations and an equal peppering of romance and action. In support of the release of the 'King's Ransom' album, director Neil Monaghan made a series of short trailers. These films had a secondary purpose - to test out the look and feasibility of a full length feature shoot. The second trailer was shot in a single day around historic Fort Horsted in Chatham, Kent. The shoot proved that using existing locations and good lighting would provide excellent production value on a limited budget. This trailer was shot on a Red Epic W 8K Helium Sensor camera. Our final, and most ambitious, trailer was a complete song from 'King's Ransom' performed by Gemma Ashley. Again we had only a day to shoot over four minutes of material - which really pushed the team to the limits. Nevertheless the results were well worth it. Here we needed to run acoustic playback of the song as well as record Gemma's performance for sync purposes. All these techniques will be needed on the upcoming features.